This Standard covers pumping systems, which are defined as one or more pumps and those interacting or interrelating elements that together accomplish the desired work of moving a fluid. A pumping system thus generally includes pump(s), driver, drives, distribution piping, valves, sealing systems, controls, instrumentation, and end use equipment such as heat exchangers, for example. This standard addresses open and closed loop pumping systems typically used in industry, and is also applicable to other applications. This Standard sets the requirements for conducting and reporting the results of a pumping system assessment (hereafter referenced as an assessment) that considers the entire pumping system, from energy inputs to the work performed as the result of these inputs. 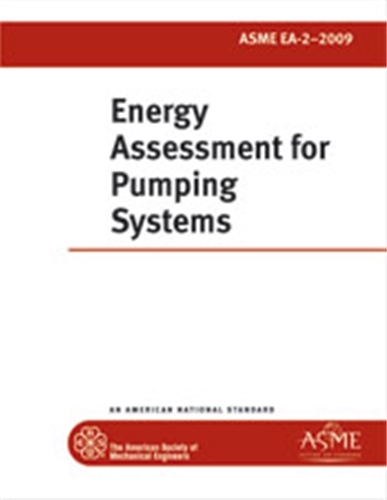 An assessment complying with this standard need not address each individual system component or subsystem within an industrial facility with equal weight; however, it must be sufficiently comprehensive to identify the major efficiency improvement opportunities for improving the overall energy performance of the system. This standard is designed to be applied primarily at industrial facilities, but many of the concepts can be used in other facilities such as those in the institutional, commercial, and water and wastewater facilities.